*App Gone FREE for JUST 2 days. 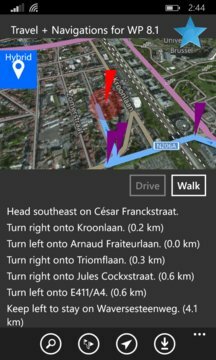 Drive+Walk Maps for Lumia Windows Phones is one of the most useful and innovative App for finding locations, routes, Maps, finding directions, roads for Car Driving and Walking as well . Many more interesting features described below. It is a perfect travelling guide, now available in your Pocket. Travel mode can be selected between Driving and Walking. ✔Feature Suggestions Box built-in to the App. ✔ Online Social Community to Socialize with other Users. This App contains sliders to change some properties of the map (cartographic mode, pitch, and heading). Map related functionality is demonstrated with retrieving and displaying the phone's current location on the map, searching the map for a keyword, and displaying a route and directions from the current location to a destination. 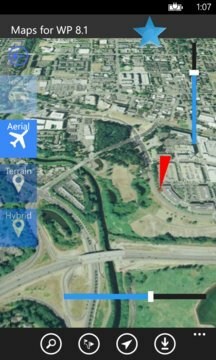 Interesting feature is a Map control with overlays for direct manipulation of the map properties cartography mode (road, aerial, hybrid, terrain), pitch (from which angle to look at the map), and heading (turning the map to change the directional heading that is pointing up). Center and zoom level properties can be changed directly by dragging and pinching the map control. Search feature initiates search functionality requiring input for a search term. If one or more hits are found for a given search term, the map is animated to the location of the first hit.